Proposals for the TESOL-sponsored EVO are due today, or by the end of this week, so that acceptances can be sent out by October 6 as promised. Today’s discussion seeks to call attention to this worthy effort, to encourage you to submit a proposal soon if you haven’t done so already (about half a dozen have been received for far with several known to be in the works), and also to suggest to all others that it would be a very worthwhile investment of time to participate in EVO this January and February by following a course or two, if not actively moderating one. This discussion can take place in a wider context including some special recent events such as the CIDER seminars where Terry Anderson just presented, and the STEMx free online conference that ended yesterday. The latter was organized by Steve Hargadon, who teams up with Shelly Terrell in the 4th Reform Symposium (RSCON4) scheduled Oct 11-13 <http://www.futureofeducation.com/page/2013-reform-symposium>, and the TESOL CALL-IS and IATEFL LTSIG one-day conference to be held on Oct 12 <http://ltsig.org.uk/events/13-future-events/318-121013-special-event-using-technology-in-teaching-principles-in-practice.html>. These are but two (that happened to take place in the past week) in a firehose of events that have been increasing in frequency, often not weeks, but days apart. The MOOC concept, whether xMOOC or cMOOC, provides steady often overlapping opportunities for deeper, more prolonged engagement not only with niche topics, but more importantly with others interested in those niches. Google Hangouts on Air now make it possible for anyone to simulcast an event, and many do, extending invitations to colleagues in a mushroom field of communities. It seems there is something of this nature going on every minute, and social media is working virally to spread the word among educators. Stepping back to a wider perspective on this phenomenon, what is going on every minute is networked, connectivist learning. Every minute! Open education, driven by learners connecting with other learners, is taking place around the clock, around the globe, in countless free spaces, bound only by the amount of time participants can make to engage and absorb the knowledge inherent in their networks. So our discussion can touch on how we might rethink our role as educators, or perhaps more importantly, encourage others to follow our example. The Hangout today is another example of how participants in social networks acquire the tools for re-thinking how they engage their students. Networked learning is ineffable in that it must be experienced to be understood, and those without that experience have difficulty grasping a full range of its affordances. As the behavior of participants in online networked learning changes, so their teaching styles change, and the better they are able to model for their students characteristics of what they find most effectively leads to their learning what they want to know in an increasingly interconnected world. This conversation was two hours long. There’s not much we can do about the YouTube video without putting in considerable effort, but I can cut the mp3 rendition into Part 1 (when most people left) and Part 2, where it was me staying out of the way of a conversation between David Weksler, Rob Perhamus, and Scott Lockman. Nina asked in the chat if the Google+ text chat was preserved. The answer is ‘no’ unless someone ‘ding!’ copies the chat and pastes it into a text file in some reduced and meaningful form, as I have done here. David Weksler mentioned know your audience? Bob Fass – WBAI? What Kinds of Learning Can We Scale with Online Resources and Activities (and what can’t we scale)? 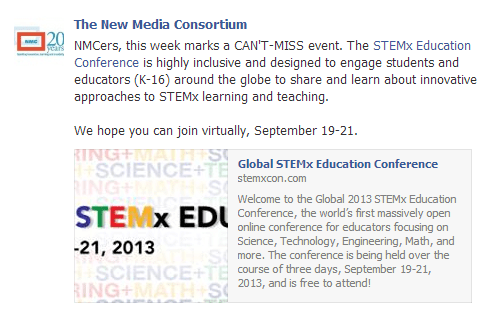 the Global 2013 STEMx Education Conference, the world’s first massively open online conference for educators focusing on Science, Technology, Engineering, Math, and more. The conference will be held over the course of three days, September 19-21, 2013, and will be free to attend! Thanks everyone who participated in this hangout, and making it publicly available for others to watch. I’m planning a talk this Friday and will be using the learning2gether community discourse as a way educators share from around the globe. Thanks for setting the example!